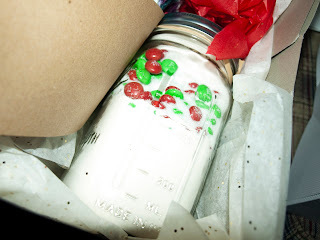 Here's a simple recipe for an M&M cookie mix in a jar! 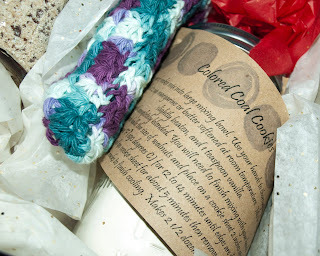 We used the red and green m&m's for the holidays and the mix was very easy to put together. My only wish was that we had saved the m&ms for the very last layer because they almost got lost in the layers of flour and sugar. Mix together flour, baking soda and baking powder. Layer ingredients in jar in order given in a 1 quart ''wide mouth'' canning jar. Add the flour mixture last. It will be a tight fit when you add the flour mixture so be sure to pack everything down firmly. Empty jar of cookie mix into large mixing bowl. Use your hands to thoroughly blend mix. Add 1/2 cup margarine or butter softened at room temperature. Mix in 1 egg, slightly beaten, and 1 teaspoon vanilla. Mix until completely blended. You will need to finish mixing with your hands. Shape into balls the size of walnuts and place on a parchment lined cookie sheet 2 inches apart. Bake at 375 degrees F (190 degrees C) for 12 to 14 minutes until edges are slightly browned. Cool on cookie sheet for about 5 minutes then remove to wire racks to finish cooling. Makes 2 1/2 dozen cookies.